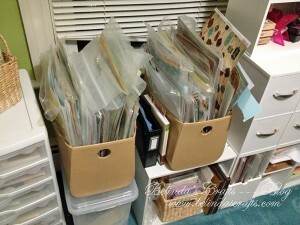 Confessions of a Scrapbook Kit Hoarder…The Intervention! 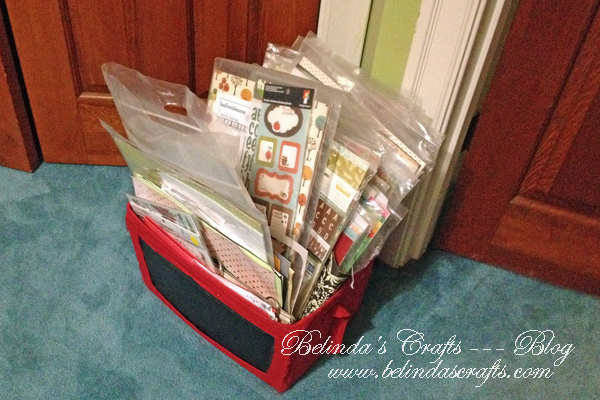 I have a confession to make…I’m a scrapbook kit hoarder! I have subscribed to scrapbook kit clubs for over 8 years now. In the beginning I would get my kits in the mail and pick through and make layouts with all the coordinating papers. It was so nice to have someone else do that sort of thinking for me. But then slowly I started looking at the kits differently. I started to say, oh this paper is so pretty oh and this embellies is so cute, I can’t possibly violate them by using them on a layout. And one after another, the kits started coming in and I keep waiting for the “perfect” layout to use the products. Ended up buying another bin to fill with kits. Then about 3 years ago, I started making cards and abandoned the whole traditional scrapbooking process. I dabbled here and there with mini projects like ‘Week in a Life” with Ali Edwards and December Dailies but still not parting with my prized stashes of kits. As a matter of fact, I would buy different paper for these projects rather than finding a way to make my stash work. This shelving contains other items but much of it is ancient kits. 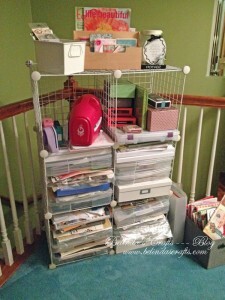 This past year, I told myself that I wanted to dip my foot in the water of scrapbooking again. So for 2013 I have been working on a Project Life album. Which I am proud to say also after many failed attempts in years past is actually getting completed. I worked out a system that works fairly well. 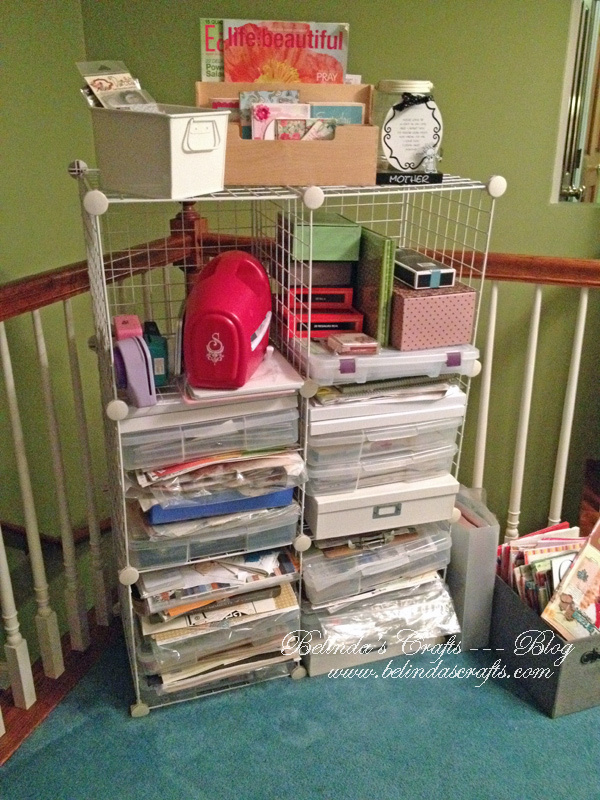 Another thing I have been doing to get my scrapbooking mojo on is listening to great scrapbooking podcasts while I work in my craft room. The one I listen too most is called Paperclippings and I went ahead and subscribed to their podcasts. The lovely part is that the host has guest panelists that talk about different aspects of scrapbooking. The most recent one talked about kits and I felt like I was meant to hear what they were discussing. One panelist in particular (Tracy Banks) talked about how on her blog she shows her process on how she uses her kits. Thus using practically all before the next kit arrives. Not a new idea but presented in such a way that I have decided this was just the intervention I needed to break the hoarding cycle. So I am going to start a new series on my blog documenting my journey to freedom. I will start with my most recent kit from Cocoa Daisy which is the September kit. So come back to see if I can stay on the right path. If you come to visit, maybe I can inspire you to break the cycle. “Thank you for your visit and comment! I too love comments, it’s a small present – someone having taken the time to read (or glance over, I’m fine with that too as I can write long posts) and then comment on it. The card stand is a very simple thing, made out of annoyance that my card kept falling over or that it was stanting too straight up for a nice picture. About this post: I like the initiative. I have just a few kits, but I did order some scrapbook paper”surprise” packages, and occasionally I buy patterned paper. But I hardly use it, indeed I too am afraid to spoil it on a failed project. I am afraid to make that first kit and see the pretty paper ruined. Also, I sometimes find it limits my imagination. Therefor I usually make my own backgrounds, it’s something I love to do. I’ve never really made a scrapbook page (only 1 as the cover of a holiday album, with the intention of doing the inside too but never got round to that). Patterned papers just aren’t my thing yet. I am addicted to stamping, and lots of new stamping/cardmaking goodies hit the (online) stores each month so I really have to be strong and not shop till I’m broke! Now I am trying NOT to buy stuff anymore, but first use more of the stash I allready have. It’s more then enough. Time to clear out by using it! Debbie we are like birds of a feather. I shop way to much without enough results. So I am hoping to turn that around. I mean what is the worse thing that can happen. We could use our supplies and create a LO that we don’t like and then just repurchase the paper again if we like it so much. At least with a LO we can see it more often than we do when it is tucked away in our kits. So I am going to dive off the diving board and I am happy you are going to take the plunge with me. what a fantastic way to get you and your scrapbook kits working together. I am really looking forward to seeing how you move forward with this and can’t wait to see what you make with your kits. I am sure you are going to inspire so many more people to start using up all their kits that just sit in the lonely corner. Hi Ria! It would be wonderful if I can help others begin to create with their supplies. I am hoping to craft my way through these kits and older kits too! Thanks for stopping by. I’ll have to go through these posts to see how far you’ve come. Kudos to you for making this goal and going “public” with it! I remember as a kid (and I STILL have this problem) is looking at a blank page and not wanting to make a mark on it for fear of ruining it! I’ve never bought scrapbook kits but could see how nice it would be to have someone put together all the accents together for you.